Earlier last year we constructed our first Sim Sandbox, a structure that housed a PC running the AR Sandbox software developed by Oliver Kreylos at UC Davis. That initial project was displayed at the American Planning Association National Conference and is currently on display in Washington, DC. However, we weren't completely satisfied with the design of the table and computer/projector housing, while it served it's purpose and was the simplest possible solution we were left believing there may be other solutions that weren't as heavy and were more mobile. We're pleased to announce that this month we're collaborating with Seth Woodard Elementary in Spokane, WA to construct version 2 of the Sim Sandbox. We've challenged ourselves to design a system that can be flat packed, constructed from largely one material, and constructed by students if necessary. In order to properly visualize how the table might be assembled we spent our last meeting making scale models of various ideas. We're focused on a relatively simple table structure which can be assembled and disassembled without the need for tools. 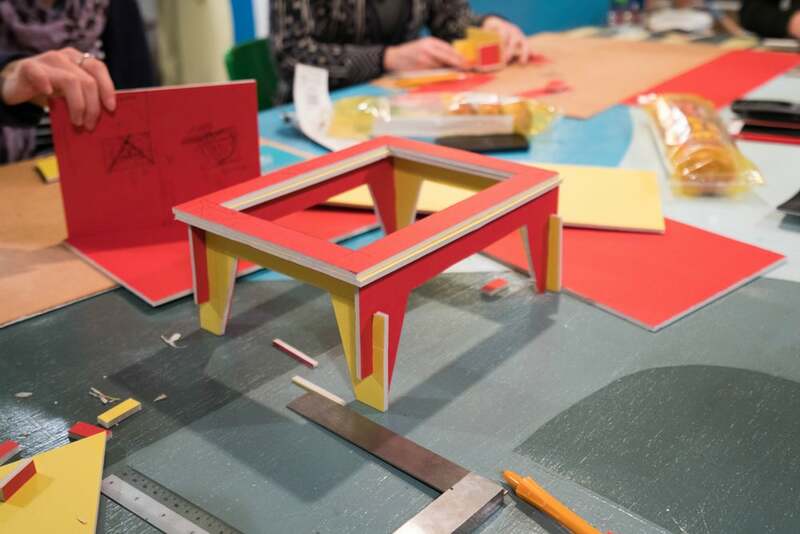 The table will be flanked by two vertical elements which will hold up the projector and kinect camera which are essential to the entire experience. We're also conducting experiments on what shapes or tools we might be able to construct from the scrap material.